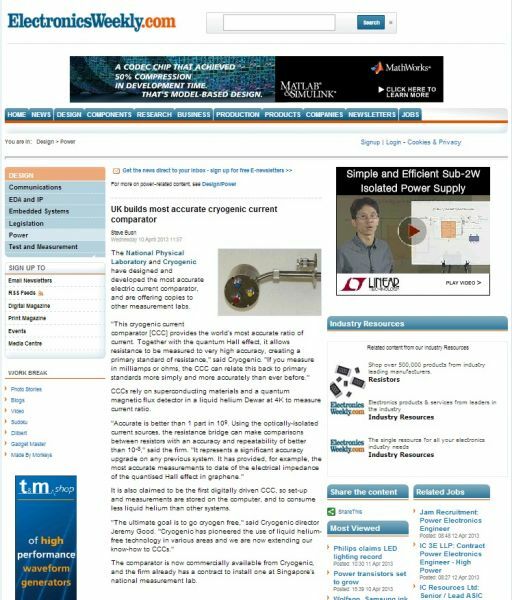 Cryogenic Ltd and the National Physical Laboratory (NPL) have unveiled what they say is the world's most accurate instrument for comparative measurements of electric current. The Cryogenic Current Comparator instrument can now be used by National Measurement Institutes (NMI) and laboratories around the world, providing a more accurate standard for current ratio, and ensuring current measurement is not a limiting factor in innovation. Accurately measuring current is vitally important for a range of applications, for example in billing people for electricity use to ensure a stable electricity market, or calculating the right current input for controlling doses of ionising radiation in cancer treatment. Challenges arise when measuring current. Ionising radiation is measured in picoamps, whilst undersea cables carry hundreds of amps. Some industries measure resistance or voltage, rather than current itself and these all need to be related back to the ampere, the SI unit of current. 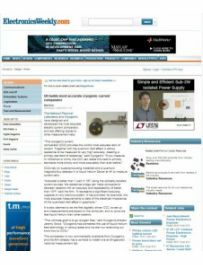 Cryogenic and the NPL say the new Cryogenic Current Comparator (CCC) provides the world’s most accurate ratio of current. Together with the Quantum Hall effect - a phenomenon whereby electrical properties in 2D materials can be determined based on fundamental constants of nature - it allows resistance to be measured to very high accuracy, creating a primary standard of resistance. Measuring in milliamps or ohms, the CCC can relate this back to primary standards more simply and more accurately than ever before. CCCs rely on superconducting materials and a quantum magnetic flux detector to measure current ratios. The CCC sits in a liquid helium dewar – a Thermos flask that hold very cold liquids - keeping it at four Kelvin and allowing superconductivity, delivering accuracy and sensitivity. The CCC’s is accurate to better than 1 part in 109. Using the optically isolated current sources, the resistance bridge can make comparisons between resistors with an accuracy and repeatability of better than 10-8. The CCC represents a significant accuracy upgrade on any previous system and has for example provided the most accurate measurements to date of the electrical impedance of the quantised Hall effect in graphene – which is a key to understanding this material’s properties. It is the first digitally driven CCC, meaning set up and measurements are stored on the computer, reducing the chance of error. 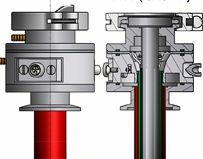 Producing a CCC that can make such accurate measurements was possible due to Cryogenic’s 30 years’ experience in high tech engineering and in house expertise in superconducting magnets and low temperature measurement systems. This CCC also has another important advantage over previous systems – thanks to innovations by Cryogenic, the dewar uses less liquid helium than other systems. Cryogens such as liquid helium are expensive and must be fed in continuously, so reductions offer a significant financial advantage to scientists. 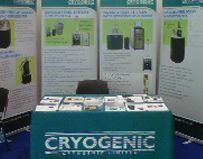 Jeremy Good, director of Cryogenic, said: "The ultimate goal is to go cryogen free. "Cryogenic has pioneered the use of liquid helium free technology in various areas and we are now extending our know-how and years of experience to CCCs. Cryogenic and NPL have been involved in the development of CCC technology for over two decades and have built up a combined internationally recognised expertise in this field. The system was originally built for NPL, one of the world’s top measurement institutes, and is used on a daily basis for its measurements. The CCC is now commercially available from Cryogenic to NMIs and industrial labs which require very precise electrical measurements. Cryogenic have already signed a contract to install one at Singapore’s NMI, where it will underpin all their electrical measurements, including: improving the accuracy of temperature measurements; analysis of super-material graphene; and fundamental physics research.